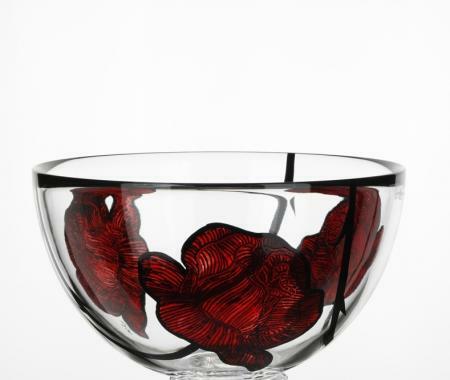 The awesome Kosta Boda Tattoo Bowl was designed for Kosta Boda by glass artist Ludvig Löfgren. Obviously Mr.Löfgren has been impacted by the artistry of tattoos because Tattoo is a deeply romantic glass tattoo with exquisite details. The large crystal bowl measures 5.125 inches tall with a 8.875 inch opening. 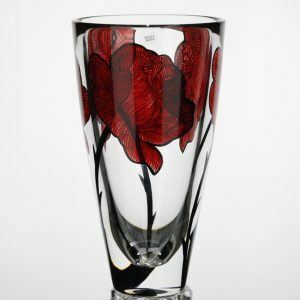 The combination of hand-made Swedish Kosta Boda crystal and the hand-painted red roses creates a true masterpiece for your home, house warming gift or wedding present. Kosta Boda crystal is an investment so we provide detailed 360 degree images. You can view the crystal bowl from all angles and get a better feel for its true beauty.